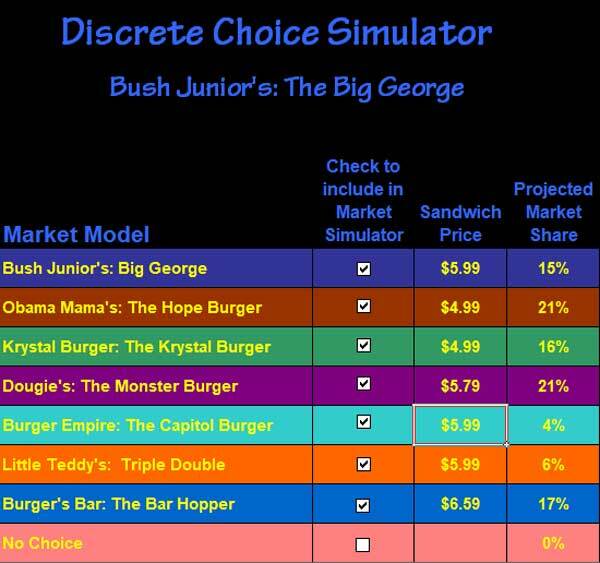 Discrete Choice – Big George Burger simulates market share and revenue for a newly introduced burger for our fictional fast-food chain, Bush Jr.’s. The model uses discrete choice logistic regression and tests price sensitivity. Email us to request a copy of the simulator. Pharmaceutical Exponential Probability Simulator calculates the probability of purchase of given product by two separate people from one of more than 20 subgroups and numerous product levels. This output is generated from a multidimensional discrete choice model. The percentage likelihood of purchase is the exponential of the fitted model for any of the 20 subgroups. Email us to request a copy of the simulator. Dual Usage Market Penetration Likelihood Simulator – A dual use simulator is a combination of discrete choice model where respondents are asked to choose one item from a list of four or five, generally with rotating prices. In addition, respondents are then asked, of the one choice they make, how likely would they be to purchase it. This extra inquiry not only allows the researcher to gauge price sensitivity, but also to determine market penetration by simply adding one more question per section. Email us to request a copy of the simulator. Maximum Difference Choice Simulator shows the increase in visits to Sloppy Joe’s American Diner if they offer various specials to their frequent customers. The increases in visitation are calculated by using Maximum Difference Analysis and forming a choice model. Email us to request a copy of the simulator. Jimmy’s Italian Deli Menu Simulator allows Jimmy’s Italian Deli to project its profit gain or loss from raising and lowering prices on individual items. The model is created by using simulated online menus where respondents order from up to 5 different menus. The menu simulator allows restaurants to test what will happen to their bottom line if they raise or lower the prices on certain items. Email us to request a copy of the simulator. Olive Oil Conjoint Purchase Intent Simulator is by far the most interesting aspect of Conjoint Analysis. This gives you the ability to “predict” the market share of new products and concepts that may not exist today. This also gives you the ability to measure the “Gain” or “Loss” in market share based on changes to existing products in the given market. Email us to request a copy of the simulator. © 2019 Multivariate Solutions. All rights reserved.